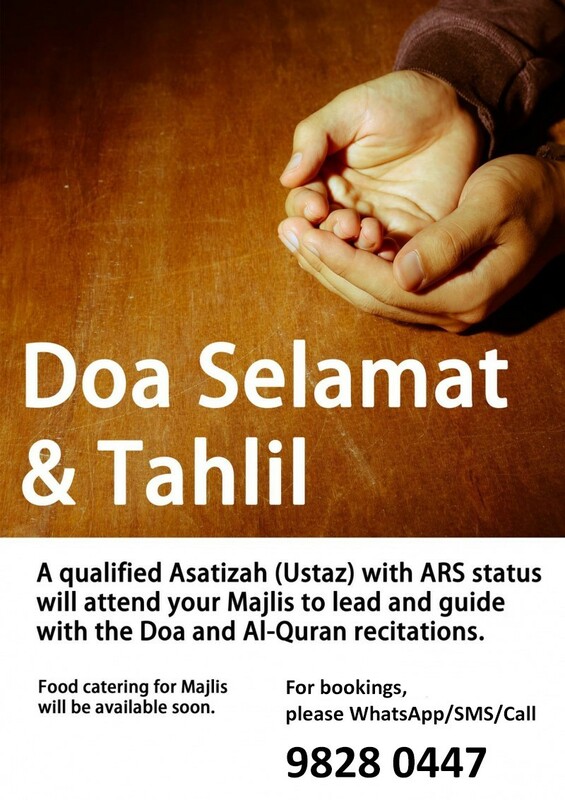 A qualified Asatizah with ARS status will attend your Majlis to lead and guide your family with the DOA and Al Quran recitations. You may also engage this service if you have just moved into a new home and wish to have the Uztaz lead the Doa Selamat and Tahlil. 1. Kindly note that only ONE Uztaz will be present for this service. 2. In any unforeseen circumstance where Uztaz has to make any last minute changes, we seek your understanding and cooperation while he finds a replacement or another suitable slot. We will issue a full refund should the Uztaz is unable to attend to your preferred date and time. For bookings, please WhatsApp / SMS / Call 98280447.